Course Website: Official Website - Visit Hawks Ridge Golf Club's official website by clicking on the link provided. 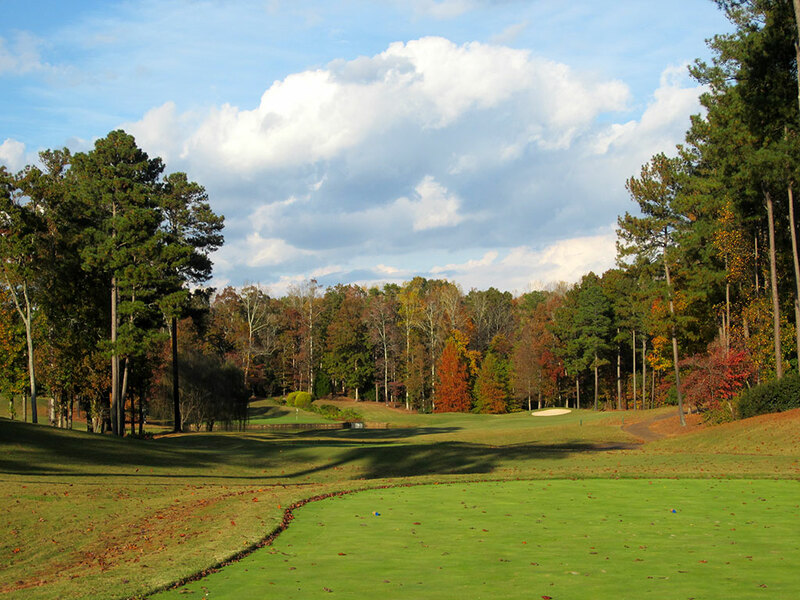 Accolades: Ranked 4th in Georgia on Golf Course Gurus' Best in State list. What to Expect: I wasn't sure what to expect with my visit to Hawks Ridge. I knew that it had previously been on Golf Digest's Top 100 list, but it also dropped off nearly as quickly as it made it on. From one person I would hear how impressive and exclusive the course was and from another person I would hear how shocked they were that Hawks Ridge had managed to climb so high in the rankings. 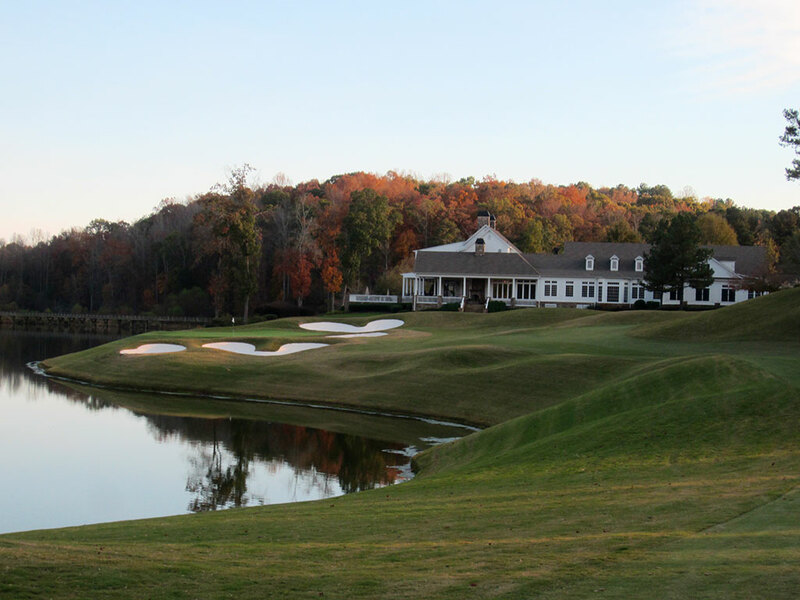 The other thing I knew from my research was that the 18th hole very well could be the most controversial hole in the Peach State. The opening hole was far from inspiring and I feared that the course was going to be overrated. However, once I embarked on the 2nd hole I was blown away by one of the most stunning two-shotters I've ever encountered. That was followed up by a stunning 3rd hole, and then 4th, and then 5th, and so on. In fact the front nine was one of the most impressive outward loops for an inland course I recall playing. 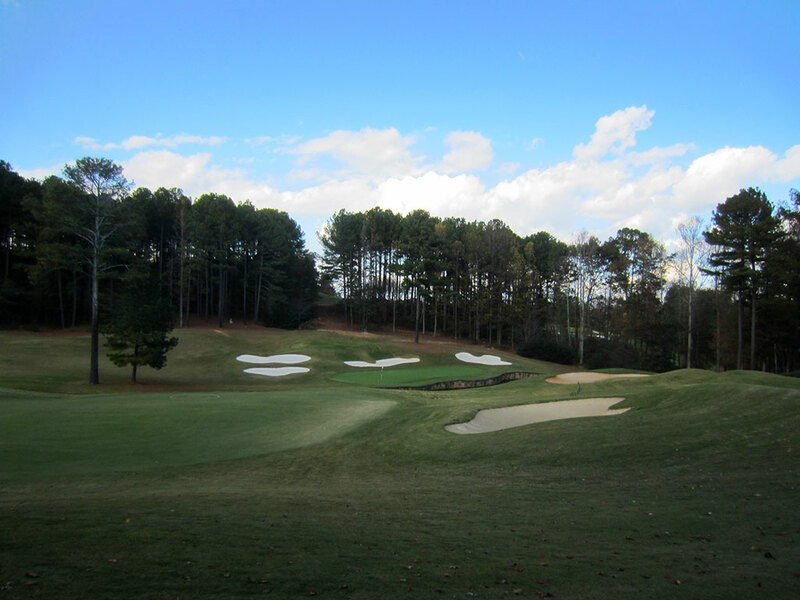 The bunkering, terrain, conditions, risk/reward design and overall setting were very much inspired by Augusta National, as Bob Cupp will admit. There is quite a bit of elevation changes throughout the course which is why you'll find most players riding in carts with a forecaddie on back. The inward nine is nearly, but not quite as impressive, as the front nine with the finishing hole creating tons of drama and controversy. 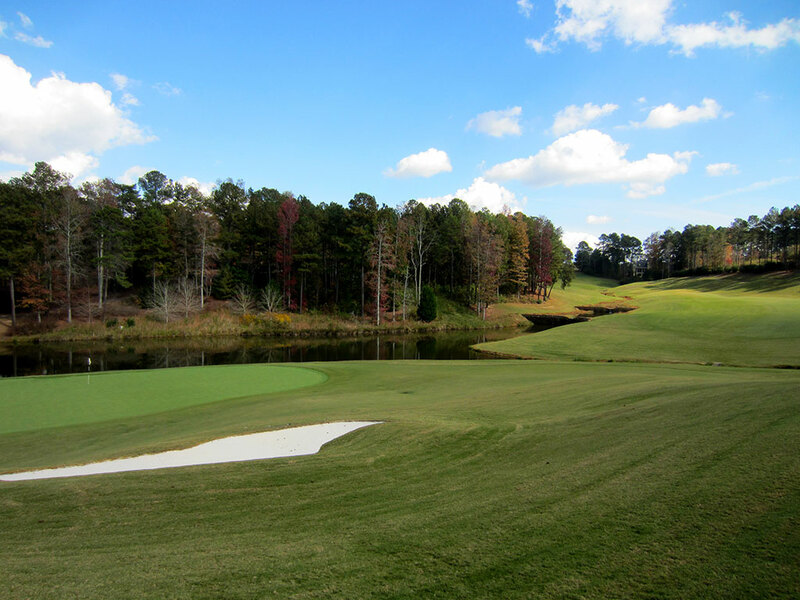 The reachable par five 18th hole features water up the entire left right, a steep side hill to the right, and large undulations with significant bunkering throughout the rest of the hole. Writing about the hole can't possibly convey what it is like to play it but I will say that while there are some changes I'd like to see on the hole, I actually like it and don't feel like it distracts from the course. When all is said and done, I was very impressed with Hawks Ridge. There are beautiful holes, strategic holes, engaging holes, and an overall impressive experience that I could see getting back into the Top 100 in the future. 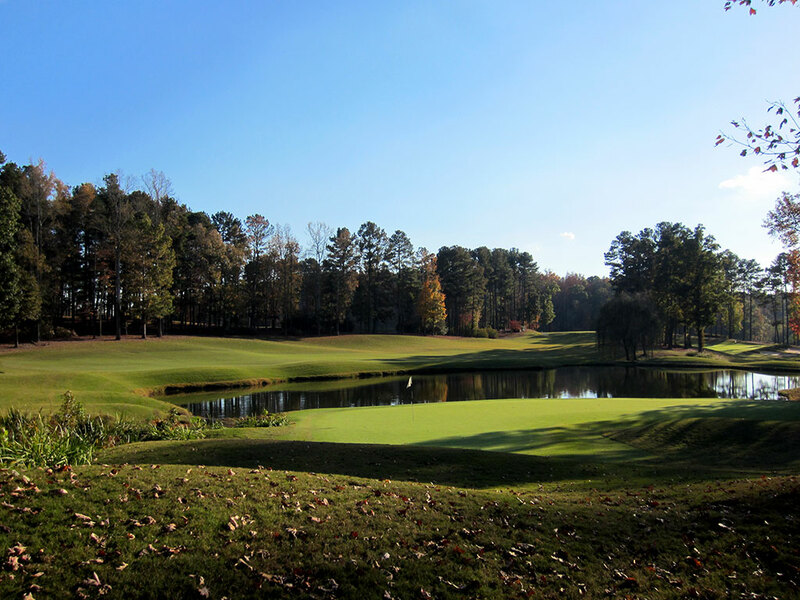 Signature Hole: 15th Hole – 333 Yard Par 4 – Hawks Ridge is blessed with several holes worthy of signature status, but given that many are featured below the 15th earns the designation here. 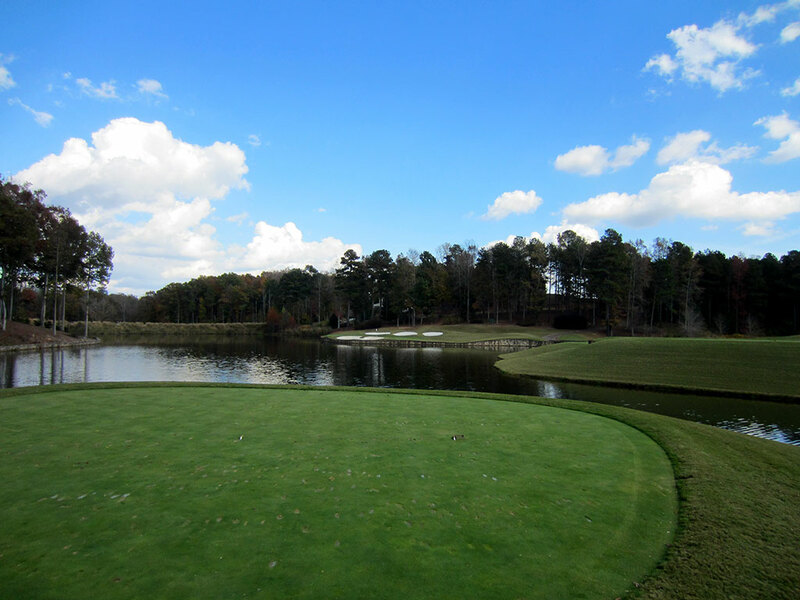 Though short in length, driving this green is not a realistic goal given that a pond fronts the putting surface and a creek borders the right creating a virtual island green. 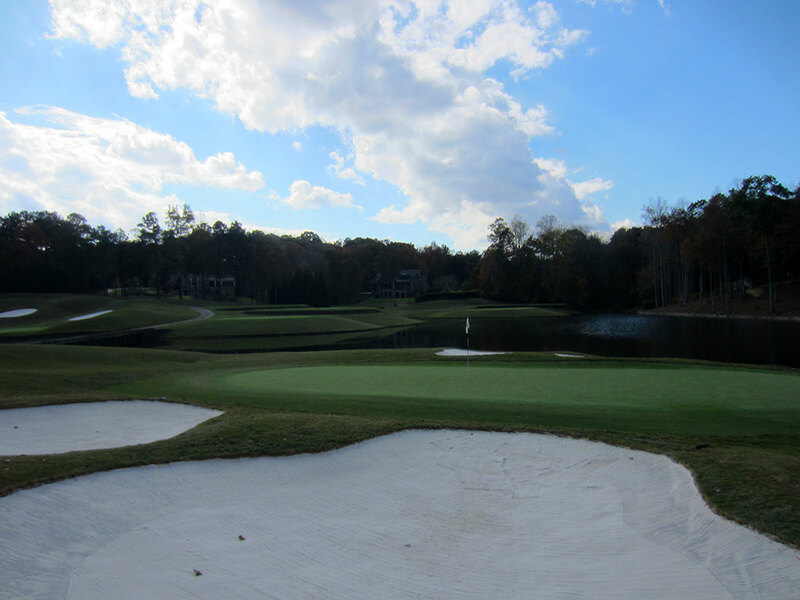 A single bunker is located at the back of the fairway before it cuts left towards the green. 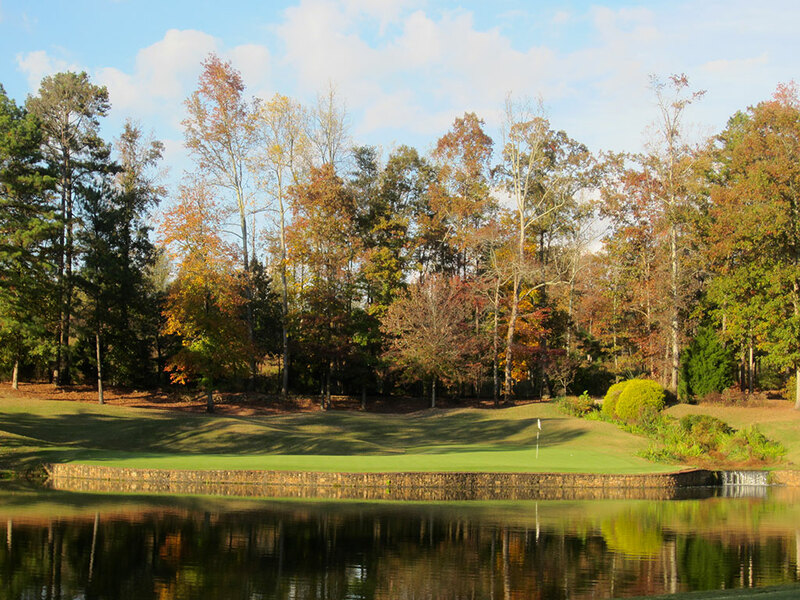 With the water reflecting in front and a hill of trees framing the back, the 15th is simply a beautiful hole. 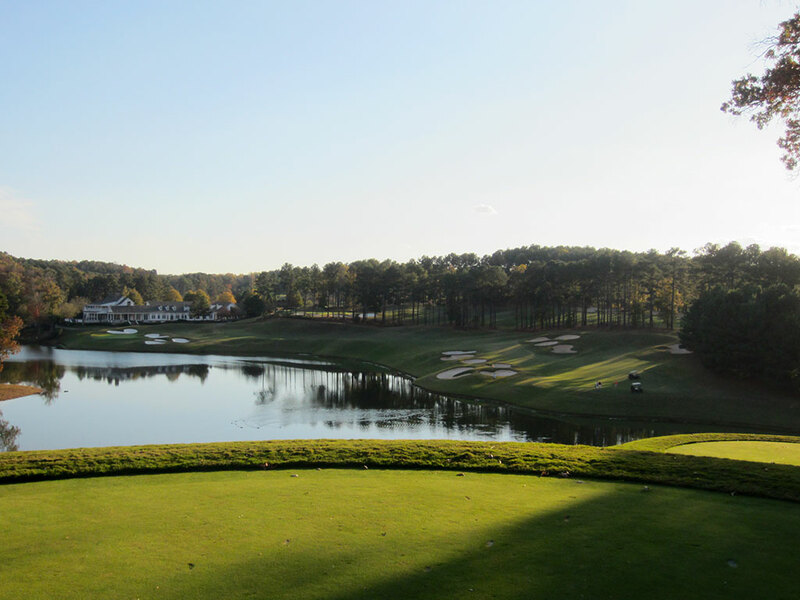 Best Par 3: 3rd Hole – 173 Yards – Reminiscent of Augusta's world famous 12th hole, this modest length par three plays over water to a green protected by a single bunker in the front and a trio of bunkers in the rear. It is a flat out beautiful hole that is framed by trees in the background and requires precision to hit the green in regulation. 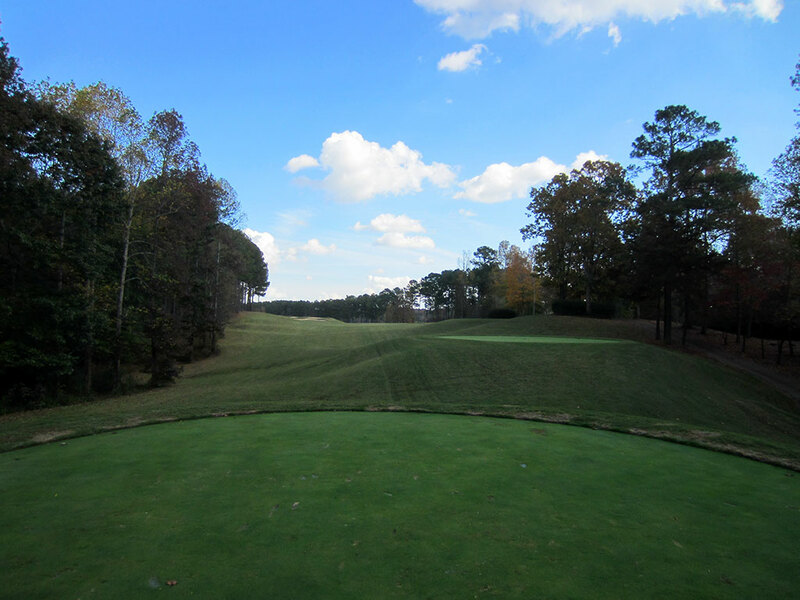 Best Par 4: 2nd Hole – 463 Yards – After hitting my tee shot and driving up to my ball my jaw may have bounced off the ground I was so impressed with the eye-candy I had just been offered. The fairway slopes to the right towards a water hazard that runs all the way up to the green. Three brilliant white bunkers are planted behind the green as players are presented with an exciting downhill approach. No doubt about it, I loved this hole and it made me very excited for the rest of the offering at Hawks Ridge. 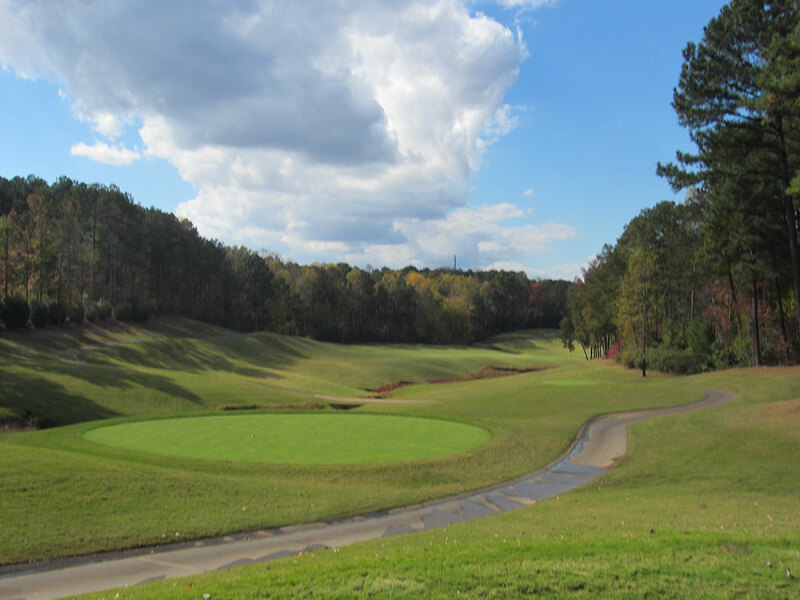 Best Par 5: 4th Hole – 573 Yards – An exceptional par five, the lengthy 4th hole plays well uphill off the tee with a forest of trees to the left and a sparser collection of trees on the right. 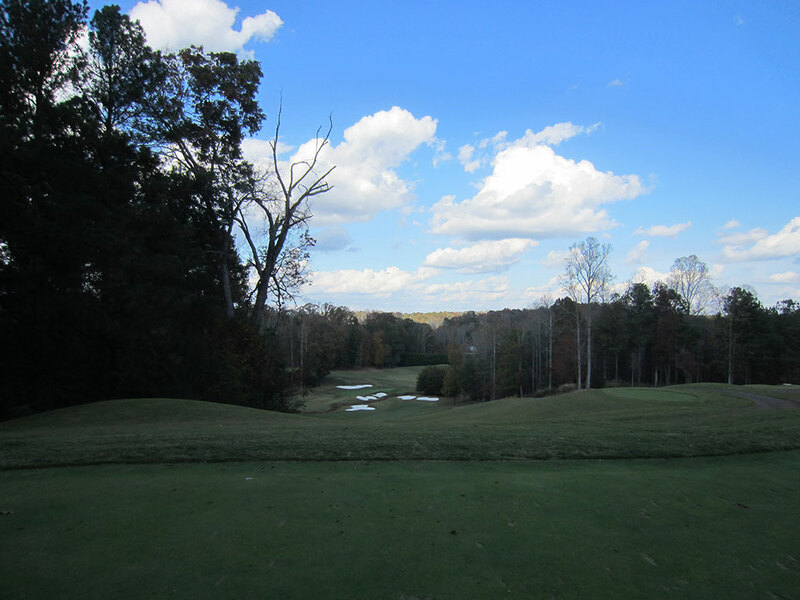 Upon cresting the hill, players are presented with a beautiful view of the hole as the fairway tumbles downhill before a creek splits the fairway from the green. Playing up the left side will open up the angle to the green but will require playing your approach shot from longer grass. Birdie Time: 6th Hole – 319 Yard Par 4 – An exciting and imaginative hole awaits players on the 6th hole that plays well down hill and is easily reachable. 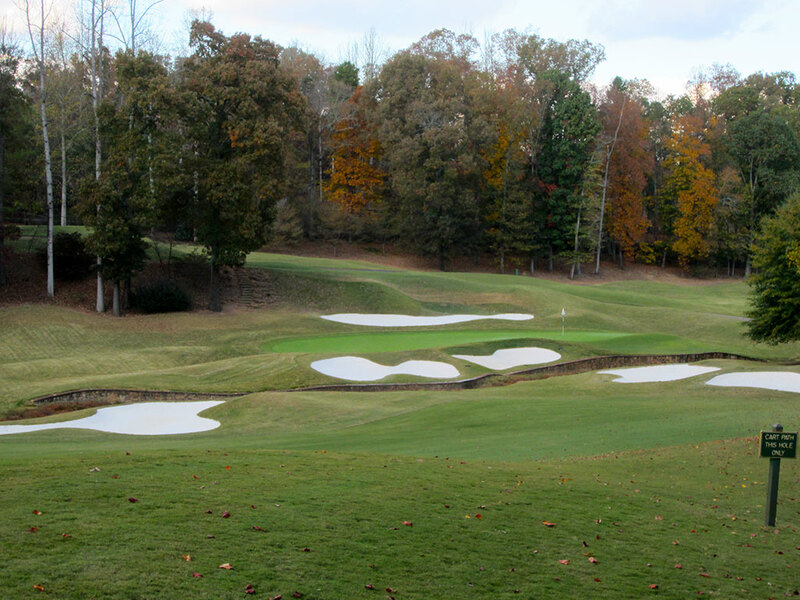 Six bunkers are in play off the tee with three of them located on the tee box side of the creek and three on the green side of the creek that meanders through the hole. Risk/reward holes like this never get old to play and often become the subject of tales told while enjoying the 19th hole. 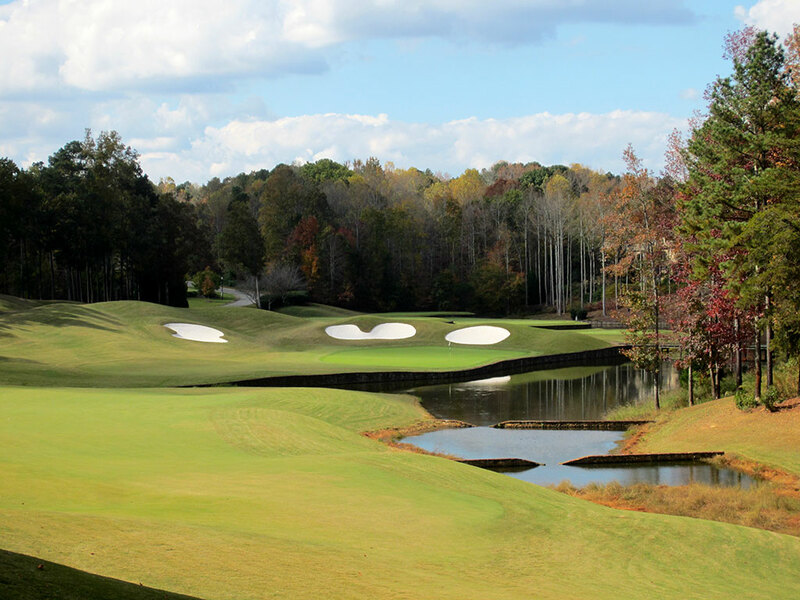 Bogey Beware: 18th Hole – 528 Yard Par 5 – Potentially the most controversial hole in the Peach State is the finisher at Hawks Ridge. An impressive view of the hole is offered from the severely elevated tee as players see the fairway turning from right to left along the water all the way down to the peninsula green. A plethora of bunkers await in the landing area where it appears there is nearly more white than green to land in. Undulations exist throughout the fairway as you travel along the water towards the putting surface which again is protected by numerous bunkers. 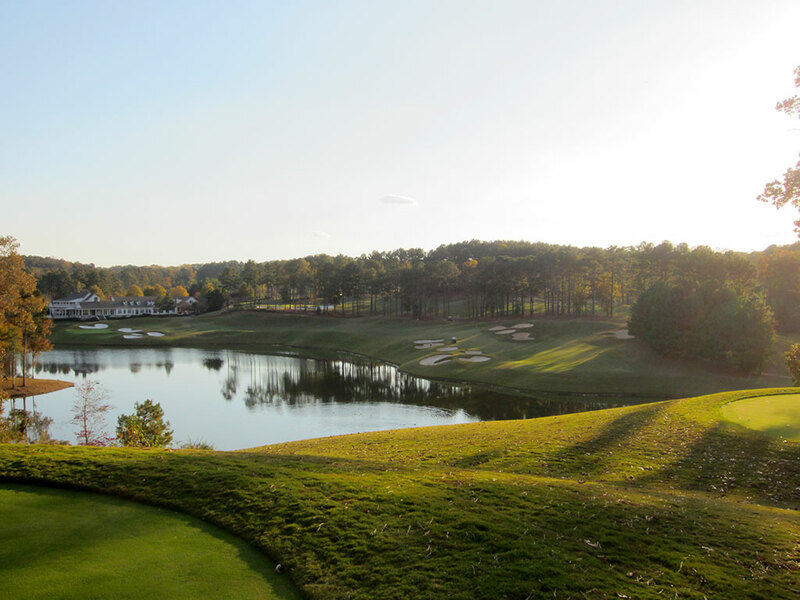 No hole will see a bigger swing in scores throughout the day than the 18th at Hawks Ridge.